Objective To assess the efficacy of slow release oral morphine (SROM) as a treatment for opioid use disorder (OUD). 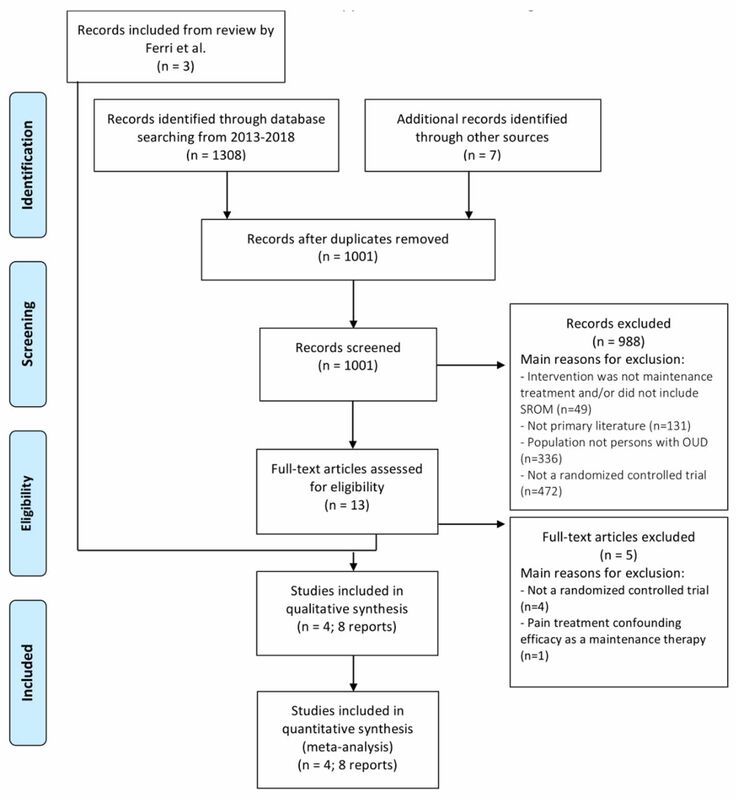 Design Systematic review and meta-analysis of randomised controlled trials (RCTs). Data sources Three electronic databases were searched through 1 May 2018: the Cochrane Central Register of Controlled Trials, MEDLINE and EMBASE. We also searched the following electronic registers for ongoing trials: ClinicalTrials.gov, WHO International Clinical Trials Registry Platform, Current Controlled Trials and the EU Clinical Trials Register. Eligibility criteria for selecting studies We included RCTs of all durations, assessing the effect of SROM on measures of treatment retention, heroin use and craving in adults who met the diagnostic criteria for OUD. Data extraction and synthesis Two independent reviewers extracted data and assessed risk of bias. Data were pooled using the random-effects model and expressed as risk ratios (RRs) or mean differences with 95% CIs. Heterogeneity was assessed (χ2 statistic) and quantified (I2 statistic) and a sensitivity analysis was undertaken to assess the impact of particular high-risk trials. Results Among 1315 records screened and four studies reviewed, four unique randomised trials met the inclusion criteria (n=471), and compared SROM with methadone. In the meta-analysis, we observed no significant differences between SROM and methadone in improving treatment retention (RR=0.98; 95%CI: 0.94 to 1.02, p=0.34) and heroin use (RR=0.96; 95% CI: 0.61 to 1.52, p=0.86). Craving data was not amenable to meta-analysis. Available data implied no differences in adverse events, heroin, cocaine or benzodiazepine use. Conclusions Meta-analysis of existing randomised trials suggests SROM may be generally equal to methadone in retaining patients in treatment and reducing heroin use while potentially resulting in less craving. The methodological quality of the included RCTs was low-to-moderate. The first meta-analysis of slow release oral morphine. We included new studies that increase the validity of the study. We included previously unpublished data obtained from primary trials. While methadone and buprenorphine/naloxone are proven effective,6 7 they have a known limited ability to attract and retain patients in treatment. For instance, past studies have demonstrated that most individuals who overdose are not on agonist treatment at the time of death, and that, overall, agonist therapies remain sorely underused with only a fraction of eligible patients in the USA accessing these therapies.8–10 While overall low rates of methadone and buprenorphine/naloxone use are partially due to poor access and limited service delivery,10 the balance of medication benefits and side-effects (eg, sweating, weight gain) and other limitations of these therapies (eg, corrected QT (QTc) interval prolongation, sleep disturbance, need for daily visits and supervised urine collection in some settings), also result in low rates of patient retention once individuals initiate therapy.11–13 The issues of poor uptake and retention on OAT are particularly urgent in the context of elevated mortality among those not on OAT and the reported dramatic rise in mortality following OAT interruption,14 as well as increasing overdose rates as a result of the emergence of highly toxic fentanyl analogues in the illicit drug markets of many settings. In the light of increasing recognition that a range of additional forms of OAT are necessary for some persons with complex OUD, interest in slow release oral morphine (SROM) as an OUD treatment agent has steadily grown.8 15 A 2013 review by the Cochrane Collaboration reviewed the literature for SROM as treatment for OUD. However, the review was ultimately unable to draw definite conclusions regarding effectiveness, identifying only three high quality clinical trials.16 However, some unpublished data were not included in this review, and since the time of its publication, a number of new studies investigating SROM have emerged, including a large international randomised controlled trial (RCT) from Switzerland and Germany.17 In light of the known limitations of methadone, buprenorphine/naloxone and medical heroin,18 these new data on the efficacy of SROM, as well as the need to identify viable OAT options that may be more attractive to patients in the context of the current opioid-related public health emergency, the present systematic review and meta-analysis was conducted to assess the efficacy of SROM as a treatment for OUD as measured by treatment retention, heroin use and opioid craving. In this report, we followed the Preferred Reporting Items for Systematic Reviews and Meta-Analyses .19 Three electronic databases were searched to obtain relevant trials published in the past 5 years since the date of search of the Cochrane Collaboration review (up to May 2018): the Cochrane Central Register of Controlled Trials, MEDLINE and EMBASE. These databases were searched by combining selected MeSH terms and free-text terms related to OUD and SROM (see MEDLINE search strategy in online supplementary appendix). We also searched the following electronic registers for ongoing trials: ClinicalTrials.gov (http://www.clinicaltrials.gov), WHO International Clinical Trials Registry Platform (http://apps.who.int/trialsearch/), Current Controlled Trials (http://www.controlled-trials.com/), EU Clinical Trials Register (http://www.clinicaltrialsregister.eu), the Italian Medicines Agency (http://www.agenziafarmaco.gov.it/en), and Trials (http://www.trialsjournal.com). References of all relevant papers were reviewed to identify further studies of relevance. Authors of potentially relevant studies were contacted for further unpublished data. All English language, RCTs were eligible for inclusion. Studies were included if they met the following criteria: 1) Studies were published in a scientific peer reviewed journal (one RCT was published as conference abstract and a corresponding MD thesis was provided by authors;20 2) They employed RCT methods (with no requirement for blinding; 3) Participants met the diagnostic criteria for OUD as defined in the Diagnostic Statistical Manuals (DSM)-IV or -V; 4) Treatment was defined as SROM with or without an accompanying psychosocial intervention; 5) Control conditions were defined as medication-only, regardless of other concurrent treatment; and 6) Outcomes assessed included treatment retention, efficacy (ie, any measure of change in heroin use) and opioid craving. The following outcomes were assessed: 1) Treatment retention, measured using dropout rates; 2) Efficacy, defined as the number of urine drug tests positive for illicit substances (including metabolites 6-Monoacetylmorphine (6-MAM) and 6-acetylcodeine (6-A-cod)) during the longest follow-up period in each study (or final weeks of preswitch phase in case of crossover trials); 3) Craving reduction, assessed through subjective reduction of scores on Opioid-Craving Scales specific to each study. These outcomes were often assessed multiple times throughout the study period and measured across varied time intervals ranging from 1 to 24 weeks, depending on the study length. Other, less common outcomes, including quality of life measures, satisfaction, physical complaints and mental health were also reported. The level of statistical significance to assess differences between treatment and control groups was set a priori at p<0.05. All citations identified by the search were independently screened based on the title and abstract by two reviewers (LG, AA). Each potentially relevant study was then reviewed in full text and assessed for all inclusion criteria. Any disagreements were resolved by discussion among reviewers (LG, AA) and additional investigators (JK, EW). Relevant data from eligible articles (ie, socio-demographics, type of interventions, outcomes, etc) were then extracted. Study quality was assessed according to the criteria indicated in the Cochrane Handbook for Systematic Reviews of Interventions.19 Each study was assessed for risk of bias in random sequence generation and allocation concealment (ie, selection bias). Blinding of participants and personnel (ie, performance bias) and of outcome assessment (that is always possible, i.e, detection bias; objective and subjective outcomes were combined) were measured; however, since blinding was considered unlikely to affect study outcome in this context,16 open-label studies were included. Incomplete outcome data (ie, attrition bias) was recorded for each eligible study. Each category of bias was assigned a rating of low, high or unclear risk using protocols from the Cochrane Handbook. There was no deviation from the quality assessment criteria. For the meta-analysis, dichotomous outcome measures (treatment retention, continuous abstinence) were analysed by calculating the risk ratio for each outcome, with uncertainty in each result expressed via 95% CIs. Continuous outcomes, such as craving, were analysed by calculating the mean difference (MD) between experimental and control groups. Given the expected heterogeneity of results among studies due to differences in population and intervention type, we employed a random-effects meta-analytic model. I2 statistic was employed to test the presence of heterogeneity between trials, and a sensitivity analysis was undertaken to assess the impact of particular high-risk trials. Flowchart of studies. Slow release oral morphine (SROM) as therapy for opioid use disorder (OUD) Preferred Reporting Items for Systematic Reviews and Meta-Analyses flow diagram. Quality assessments for each study are presented in table 1. Three out of four studies were found to be at low risk for selection bias – the fourth study’s selection bias was agreed to be unclear, due to an unspecified randomisation technique.27 There was mixed-risk of bias relating to blinding of participants and outcome assessments; however, as noted by Ferri et al, objective outcomes—such as retention and urine drug screens—are unlikely to be impacted by a lack of blinding.16 Three of the four included RCTs were therefore open-label.17 27 28 All four studies were found to be at low risk for attrition bias. Additionally, differences in our risk of bias assessment and the previous Cochrane review were also identified.16 For the trial by Giacomuzzi et al,27 we assessed blinding of outcome assessment to be of high risk while the previous review assigned unclear risk. Blinding of outcome assessment was not possible because the treating physician could terminate patients if three consecutive urine tests were found positive for 6-MAM (data from Dr Giacomuzzi). 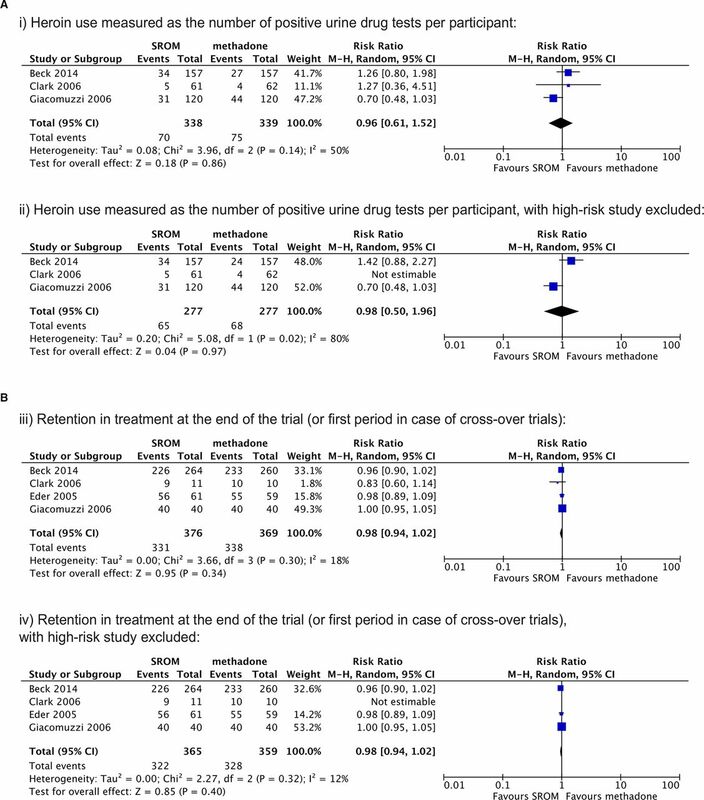 A 2013 Cochrane review by Ferri et al described three trials included in the present analysis.16 Clark et al,28 and Eder et al,26 both performed crossover RCTs, wherein participants with OUD were randomised to take either SROM or methadone for the first half of the trial period, then subsequently switched to the other treatment for the second half of the trial period. According to the published conference abstract and MD thesis, Clark et al,20 conducted a 12-week open-label crossover study that required patients to be taking methadone prior to enrolling (n=9). The authors found SROM to have lower retention than methadone; however, no significant differences were found in regards to heroin use (6--MAM) in the last 4 weeks of treatment, use of other drugs over the study period, dollars spent on heroin in the final week of treatment, mental health and social functioning (as measured by the BASIS-32 Behaviour and Symptom Identification Scale), self-reported days of heroin use, or heroin cravings. SROM was found to yield significantly lower scores on Subjective Opiate Withdrawal Scale (SOWS) (by 1.1 on the SOWS Scale (95% CI: 0.6 to 1.7), p<0.001). Eder et al conducted a 14-week double-blind crossover study that required participants not to be on any agonist treatment prior to enrolling in the trial (n=55). No significant differences were found between SROM and methadone on retention rates (103 (94%) patients completed the study) or illicit drug-use (consumption of cocaine was significantly reduced to 23.3% (p=0.0083) by day 21; additional consumption of benzodiazepines remained almost unchanged throughout the study period at approximately 40% (highest (44.7%) on day 10; lowest (32.0%) on day 20); additional consumption of amphetamines was very low, with only two positive urine specimens on day 3). However, SROM was associated with significantly fewer physical complaints (falling from a mean score of 21.7 at baseline to 12.5 at day 21 among patients treated with SROM, p<0.05), less craving for heroin, cocaine and alcohol (data from Visual Analogue Scale presented as charts only, p<0.05), lower depression scores (falling from a mean score of 17.84 at baseline to 10.51 at day 21 among patients treated with SROM, p<0.001), and lower anxiety scores (data from the State Trait Anxiety Inventory presented as charts only p<0.01). Giacomuzzi et al,27 conducted a 24-week, open-label, RCT, wherein participants who had OUD and who were previously on methadone (n=120) were randomised to take either SROM, buprenorphine, or to continue methadone treatment. These participants were then compared with an equal number of patients being newly treated for OUD, and thus taking no OUD pharmacotherapy (n=120). Therefore, a denominator of n=240 is indicated for this study throughout the manuscript. Overall, Giacomuzzi et al found SROM to be associated with significantly lower consumption of opioids (unpublished data: methadone 36.7%, buprenorphine 19.2%, SROM 25.8%, p<0.001) and cocaine (unpublished data: methadone 3.3%, buprenorphine 6%, SROM 3.3%, p<0.001); however, scores on the Lancashire Quality of Life Profile, such as finances (methadone 4.4, buprenorphine 4.2, SROM 2.6, p<0.001), family (methadone 5.8, buprenorphine 5.1, SROM 3.4, p<0.05) and overall satisfaction (methadone 5.3, buprenorphine 4.9, SROM 4.1, p<0.001), were significantly lower than for methadone or buprenorphine. Analyses of physical complaints on each treatment yielded mixed results. Beck et al,17 conducted a 22- week, randomised, open-label, crossover study of patients maintained on methadone in Switzerland and Germany (n=157), disseminated via four study reports. First, a non-inferiority study found no significant differences between SROM and methadone in treatment retention (period 1: 88.7% vs 91.1%; period 2: 82.1% vs 88.0% for SROM vs methadone, period 1: p=0.50, period 2: p=0.19) or incidence of adverse events (81% SROM vs 79% methadone, p=0.62). The proportion of heroin-positive urine drug screens (6-6-MAM and 6-A-cod) was found to be significantly higher on SROM (0.20±0.26 SROM vs 0.15±0.23 methadone, p<0.001); however, this difference fell within a prespecified inferiority margin of 10%, leading the authors to confirm the non-inferiority of SROM compared with methadone. SROM was also found to have significant dose-dependent effects on the number of positive urine drug screens, with higher doses yielding fewer positive screens (Pearson’s correlation coefficient: −0.1941 for positive 6-MAM and −0.1709 for positive 6-A-cod, p<0.05). A second study similarly confirmed the non-inferiority of SROM to methadone;29 SROM was associated with higher treatment satisfaction (SROM: 7.6±1.8 vs methadone: 6.0±2.2, p<0.001), and fewer adverse mental symptoms (SROM: 0.61±0.56 vs methadone: 0.68±0.60, p<0.01). No significant (p=0.48–0.99) differences were found between number of self-reported days of heroin-(SROM: 6.4±11.7 vs methadone: 6.4±11.3), cocaine-(SROM: 2.4±6.0 vs methadone: 2.2±6.2), benzodiazepine-, (SROM: 8.2±17.4 vs methadone: 7.4±15.8) and alcohol-use (SROM: 14.5±21.7 vs methadone: 14.5±20.8) between SROM and methadone. A third study reported that heroin-craving scores (as measured by Visual Analogue Scale and brief craving questionnaire) were significantly lower on SROM than on methadone (Visual Analogue Scale: 3.3±2.4 vs 2.5±2.2; brief craving questionnaire 2.9±1.4 vs 2.6±1.2 for methadone and SROM respectively, p<0.0001), and that cocaine-craving scores were statistically similar between the two treatments (Visual Analogue Scale: 1.6±2.0 vs 1.4±1.9; brief craving questionnaire 2.1±1.2 vs 2.1±1.2 for methadone and SROM respectively, p=0.54).23 Finally, a fourth study reported on a 24-week extension phase, where all subjects in the initial crossover trial either continued or were placed back on SROM.24 This report again found that SROM was associated with fewer cravings for heroin (Visual Analogue Scale: 2.06±2.33 vs 2.70±2.63; brief craving questionnaire 2.25±1.30 vs 2.50±1.43 at the end and start of extension phase respectively, p<0.01) and statistically similar self-reported drug use (heroin: 0.08±0.18 vs 0.11±0.21; Cocaine: 0.05±0.17 vs 0.06±0.18; benzodiazepine: 0.15±0.34 vs 0.19±0.36; alcohol: 0.22±0.36 vs 0.24±0.38 at the end and start of extension phase respectively, p=0.26–0.54); however, as no control group was present, data from the extension phase was not included in the analyses of this review. (A) Forest plot of the effects of slow release oral morphine (SROM) on heroin use as measured by urine drug tests among persons with opioid use disorders (OUD) in randomised controlled trials (RCTs); Intention to Treat (ITT) population. (B) Forest plot of the effects of SROM on retention in treatment among persons with OUD in RCTs; ITT population. RR, risk ratio. Acceptability of treatment was measured via participant dropout. Dropouts were assessed in four studies,17 26–28 with 471 participants (note: unpublished data were sought and obtained from two studies).17 27 Retention was assessed for the entire duration of the trials. As shown in figure 2B-iii and and B-iv, the results of the meta-analysis suggest that the difference in dropouts was not statistically significant between participants in the SROM vs methadone (RR=0.98; 95% CI: 0.94 to 1.02, p=0.34), while low (18%) heterogeneity between studies was observed. As one included study was published as a thesis and conference abstract and contained a small sample size (n=24), a sensitivity analysis was run wherein this study data was excluded. This exclusion did not change the results (figure 2A-ii and and B-iv). It was not possible to convert all data reported on outcomes into meta-analysis due to variance in reported data. Because continuous outcomes, such as craving, were reported in less than two studies, a meta-analysis was not performed. Currently, SROM is available as an alternative to methadone in a range of European jurisdictions,31 32 as well as in Canada.4 Our findings concur with the new Canadian National Guidelines on the treatment of OUD, which recommend SROM as a treatment option, and with the findings from earlier systematic reviews though none of them had sufficient data for the calculation of the pooled effects for treatment retention and heroin use.4 15 16 In particular, our analyses considered new unpublished data that were not included in past reviews, as well as data from a new trial from Switzerland and Germany,17 thus confirming the apparent non-inferiority of SROM compared with methadone. Although a number of gaps in our understanding of SROM persist (for instance, the absence of mortality and detailed safety data), the current review underscores the clinical utility and potential for scaling up SROM as an agonist treatment for OUD, relevant beyond European and Canadian settings. The results reported in the present systematic review and meta-analysis are subject to several limitations. First, the body of evidence regarding the efficacy of SROM in managing OUD is still relatively small. As such, additional research will help to illuminate the role that SROM can play in meeting the needs of specific patient subgroups. For instance, the relative ability of SROM to engage and retain patients with OUD in the context of the fentanyl epidemic. Second, the methodological quality of the included RCTs was low-to-moderate and the sample sizes were modest. In terms of comparing SROM to buprenorphine/naloxone, because of the latter’s improved safety profile,14 33 the recently published Canadian guideline recommends staging therapies with buprenorphine/naloxone recommended for first line therapy with methadone or SROM being offered to those unsuccessful with first line treatment.4 As such, head-to-head comparisons of buprenorphine to SROM may not be warranted. Third, some outcome measures were not uniformly reported across studies and, therefore, were difficult to combine in a meta-analysis. Heroin use was amenable to meta-analysis as it was reported in a consistent manner by three studies.17 26 28 Fourth, the analysis used some outcome data from the period before crossover occurred in trials. Therefore, these results are based-off of short durations of 6 to 12 weeks. Additionally, while one included RCT was only published as an abstract in a scientific peer reviewed journal,20 the full results of the RCT were not published in a peer reviewed journal; nevertheless, the RCT was included in a previous Cochrane systematic review.16 Finally, with respect to quality, we identified moderate heterogeneity and a risk of bias related to inconsistent blinding of participants and unclear blinding of outcomes across studies. Differences in study design and duration were also present. Given these multiple potential sources of possible bias, SROM should remain an area of future study, where future studies should address the sources of heterogeneity (such as outcome measurement design and study duration) and consider impact on overdose and mortality, as highlighted above. The present meta-analysis demonstrates the consistent pattern in clinical trials evaluating the impact of SROM. Because most OUD patients do not access agonist therapies,10 and since poor retention in methadone has been linked to heightened mortality and other health outcomes,14 SROM may have a promising role in OUD treatment, especially given methadone’s known side-effect profile, the likely attractiveness of SROM to some patients and the apparent reduction in craving when on SROM in comparison to methadone.8 17 28 Unless future trials report contradictory findings, the public health crisis presented by illicitly manufactured opioids,2 and the known limitations of existing agonist therapies,14 34 these data should inform future investigations of SROM as a therapeutic tool among people undergoing treatment for OUD. We thank Peter Vann, Emily Wagner and Ahmed Adam for assistance with research. NIDA. WMOverdose Death Rates: National Institute on Drug Abuse, 2017. (WHO); WHO. Guidelines for the psychosocially assisted pharmacological treatment of opioid dependence. Geneva: Switzerland, 2009. (ASAM); ASoAM. The national practice guideline for the use of medications in the treatment of addiction involving opioid use, 2015.
. Physical effects of methadone maintenance treatment from the standpoint of clients. Addict Health2010;2(3-4):66–73.
. Expanding the Options for the Treatment of Heroin Dependence with Oral Supervised Opioid Substitution Therapy: LAAM, Buprenorphine and Slow Release Oral Morphine as Alternatives to Methadone: University of Melbourne, Department of Medicine, St Vincent’s Hospital, 2006. Substance-Related and Addictive Disorders. American Psychiatry Association: American Psychiatric Publishing, 2013.
. A randomised trial of once-daily slow-release oral morphine versus methadone for heroin dependence. Drug and Alcohol Dependence2002;Suppl 1:S33. EMCDDA. Year of introduction of methadone maintenance treatment, high-dosage buprenorphine treatment, heroin-assisted treatment, slow-realease morphine and suboxone lisbon: European monitoring centre for drugs and drug addiction. 2009http://www.emcdda.europa.eu/stats09/hsrtab1 (Accessed 13 Apr 2018). Contributors JK and EW conceived the idea for and designed the study. JK and LG conducted the research and wrote the first draft of the manuscript. SMG, CR, MES, NF contributed to the study design, interpretation of the findings and preparation of the manuscript. All authors reviewed and approved the final version of the manuscript. Ahmed Adam screened the titles, fulltexts and assessed risk of bias in the included studies. Funding The study was supported by the US National Institutes of Health (R25DA037756). This research was undertaken, in part, thanks to funding from the Canada Research Chairs program through a Tier 1 Canada Research Chair in Inner City Medicine that supports Dr. Evan Wood. A European Commission grant (701698) supported Dr. Jan Klimas. The study was also supported by the Canadian Institutes of Health Research through the Canadian Research Initiative on Substance Misuse (SMN–139148) - and a Foundation Grant to Dr. Evan Wood. We thank Ahmed Adam for help with searching and screening. Dr. M. Eugenia Socías is supported by Michael Smith Foundation for Health Research (MSFHR) and Canadian Institutes of Health Research (CIHR) fellowship awards. Dr. Nadia Fairbairn is supported by a Michael Smith Foundation for Health Research/St. Paul’s Foundation Scholar Award. Data sharing statement The data are extracted from published papers that are available via the individual journal websites.